Australian rapper Iggy Azalea makes chart history with singles at No.1 and No.2 on the Billboard Hot 100, a feat matched only by The Beatles. 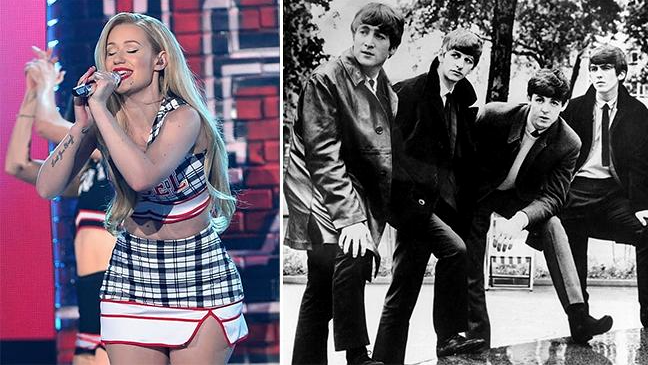 It's a fab week for Iggy Azalea, who earns a chart honor not achieved since the Beatles swarmed the U.S. in early 1964. The Australian rapper crowns the Billboard Hot 100 with her debut hit "Fancy," featuring Charli XCX. As Azalea also rises 3-2 as the featured artist on Ariana Grande's "Problem," Azalea joins the Beatles as the only acts to rank at Nos. 1 and 2 simultaneously with their first two Hot 100 hits. DIdn't Ashanta do this years ago (when she was hotter than fish grease)? She had the number 1, 2 and 3 spot. Let me go back and check for sure though. I ain't checking for her either. She wack her songs wack, her sytlist wack this damn article is wack.....and NO I didn't read it.